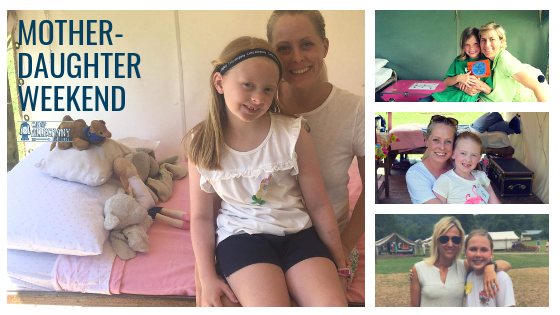 Mother-Daughter Weekend is a fun-filled on-site introduction to Camp Alleghany for Girls for prospective campers and camp moms (or other female family members). Prospective first-time campers are girls ages 5-10 who’ve never been to ‘Ghany before. The would-be camper is curious about coming to be a camper and is asking mom to try it out! Or, moms are taking the lead — you’ve heard about camp and think this would be a good way to introduce camp to your daughter(s). The camper can be a sibling of a current camper, but the prospective camper themselves must not have come to camp nor are they planning to come to Mini Camp during the same summer they’re coming to Mother-Daughter Weekend. Our first Mother-Daughter Weekend is June 14-16, 2019. Thereafter it is planned to be the first weekend before our scheduled Mini Camp session each summer. Make new friends and meet new people. Sleep in a tent with another mother-daughter pair with up to five people per tent. Eat meals in our Dining Hall. Shower in our brand new Bath House. Learn and sing camp songs. Get a taste of our daily Activity offerings. Enjoy Evening Activities, such as a campfire, and maybe a scavenger hunt, possibly even watch the counselors perform skits! Swim or canoe in the Greenbrier River if you want. You’ll also meet the Head of Mother Daughter Weekend, Ace Dandridge, who will have been your communication liaison throughout the registration and preparation period. And making your experience great are all of our awesome Term Counselors, who will be ready to lead you in activities and show you the ropes. Also, all our awesome alumna Mini Camp Counselors will join in on a few things, and will be there to answer questions and talk about their own ‘Ghany experiences. Not open to campers currently enrolled in this summer’s Mini Camp, nor for campers who’ve previously attended ‘Ghany. With the focus on our campers’ enjoyment, and getting a taste of real camp life, safety and health remain our top concerns. To that end, all our normal rules, regulations, and policies will be followed during this weekend, including that, even within our evening socializing and in our tents, this is an alcohol-free experience. We take tent requests for pairing with a friend or another family member. But please NOTE: Only Mother-Daughter Weekend allows for tent requests. Tent requests are strictly off limits for Mini Camp and Term Camp.